One argument used by the plaintiff in the Judicial Review on Article 50 was the Government's claim that, once notice had been given that the UK intended to leave the EU, it could not be revoked. Because this was such a final step, it was held that the act of invoking the Article inevitably meant that our membership of the EU cease, with all the consequences that flowed from that. Now, it seems, the Government is exploring the possibility that Article 50 isn't the last word, and the notice can be revoked. In particular, it is seeking views on whether it can be reversed by parliament at any time before the UK our exit takes effect. The theory is that, if it can be shown that parliament can vote to revoke article 50 during the negotiation period, thereby forcing the Government's hand, the outcome of the appeal to the Supreme Court would be different, because "it would imply that the sovereignty of parliament had not been removed". 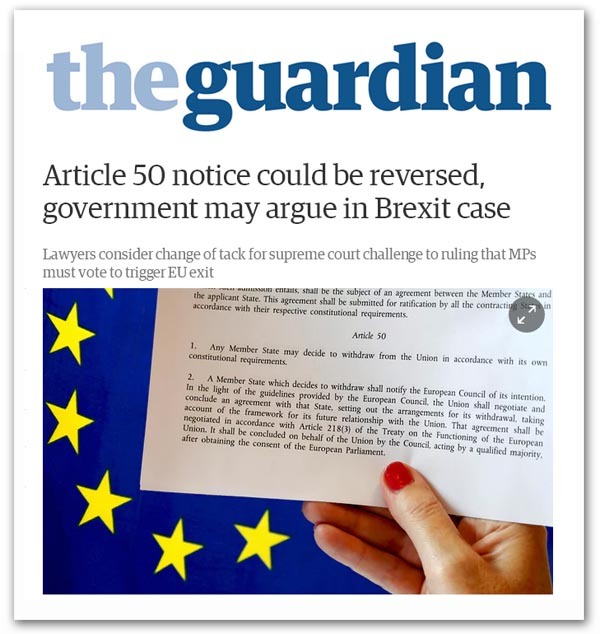 Dr Eirik Bjorge, a senior law lecturer at Bristol University and an expert in EU law, says: "If the government decides to – and is allowed to – argue that the article 50 notice can be revoked, then it is all but sure to win in the Supreme Court. In those circumstances it cannot be said that, once the trigger has been pulled, the bullet will inexorably hit the target and expunge our rights under the European Communities Act 1972". Prof Takis Tridimas, an expert in EU law at King's College, London, believes Article 50 could be reversed. before the UK's exit from the EU had been completed. He states: "There's nothing in the wording of article 50 which says that it cannot be withdrawn. The Vienna Convention on the Law of Treaties (VCLT) says that they can be reversed unless they state otherwise. The point of no return is two years after notification has been given [to the EU] ". Then Prof Paul Craig, an Oxford University expert on both EU and constitutional law, said the triggering of article 50 should be revocable by parliament. "It is a cardinal legal principle that a party is not bound by a contract or treaty until agreement has been reached", Craig argues. "The consequences of not being able to revoke would be particularly severe: withdrawal would have to proceed even if invocation of article 50 triggered an economic meltdown in the country". How this plays out will be interesting to see but, in many ways, going to the Supreme Court (or any court) for a resolution of this issue is the wrong place to be. What should be appreciated is that the law is not necessarily the dominating factor in treaty negotiations. It must always be remembered that the decision to leave is a political act, made by politicians. It is not a legal decision drafted by lawyers. One thus calls to mind de Gaulle's famous remark that: "treaties are like maidens and roses, they each have their day". In the early days of the negotiations on British entry, de Gaulle was quite prepared to abrogate the Treaty of Rome in order vary the deal on offer. Then, when France first rejected the UK application, the remaining "Five" were prepared to consider abandoning the Treaty in favour of an agreement with the UK, without involving France. And although lawyers are being consulted on this issue, and Article 50 negotiations will be conducted within the framework of treaty law, it is at the political level that talks will be held and at which decisions will be taken. As Sir David Edward, the first British Judge of the European Court of First Instance, remarked, while we are entitled to look for legal certainty, all that is certain is that EU law would require all parties to negotiate in good faith and in a spirit of cooperation before separation took place. "The results of such negotiation", he concluded, "are hardly, if at all, a matter of law". In this context, we are already fully aware that, in practical European politics, treaties have a habit of meaning what the parties intend them to mean. The legalities are then brought into line with the reality. Furthermore, whenever considering legal issues, analysts should not allow themselves to be misled by selective quotations. Such can be used to support virtually any view on the legal niceties of leaving, and there are plenty of well-founded texts on which polemicists can rely – all of which go to show that even the application is not a settled issue. But this is a domain inhabited by theory and countervailing argument, with no absolutes and no agreement even between practitioners, as can be seen from this paper, contrasted with this one. What is helpful though, with all the necessary caveats, is one paper produced by the European Central Bank (written in the context of a euro member seeking to leave the common currency). It states – with an admirable degree of understatement - that "the assertion of an implied right of unilateral withdrawal from the treaties, even in exceptional circumstances, would be highly controversial". But it does concede a right to leave, "as a last resort in the event of … extraordinary circumstances affecting a Member State's ability to fulfil its treaty obligations". The conclusion of a referendum in which the electorate instructs its government to withdraw from the European Union, thus removing any mandate to fulfil treaty obligations, would appear to constitute "extraordinary circumstances", within the ambit of Article 61 of the VCLT. This Article states: "A party may invoke the impossibility of performing a treaty as a ground for terminating or withdrawing from it if the impossibility results from the permanent disappearance or destruction of an object indispensable for the execution of the treaty". Democratic consent can be taken as "an object indispensable for the execution of the treaty" in which event the "leave" vote signifies the removal of democratic consent and fulfils the terms of the Vienna Convention. On that basis, the Article 50 process is merely the mechanism to give effect to a decision already made. Following notification, there is no explicit provision written into the EU treaties for rescinding the decision to leave, or for terminating the negotiations. On the face of it, the procedures, once started, must continue. However, Tridimas is right about the VCLT having some relevance, specifically Article 68, which permits "a notification or instrument relating to the intended termination of a treaty to be revoked at any time before it takes effect". Once lawyers get stuck in though, nothing is ever quite what it seems. To counter what appears to be an absolute right in the VCLT, other lawyers might rely on the dictum, ubi lex voluit, dixit; ubi noluit, tacuit. This arcane bit of Latin, roughly translated, means that where the law (treaty) has no wish to regulate a matter, it remains silent. Thus, because Article 50 specifically does not deal with the matter of revocation, it must be assumed that revocation is not permitted. If it was intended, the Article would have said so. This, of course, relies on the principle of lex specialis derogat legi generali – effectively, specific law overrides general law. If European Union Treaty provisions are taken as overriding Article 68 of the Vienna Convention in the absence of explicit provisions in the Lisbon Treaty, a right to rescind the Article 50 notification cannot be assumed. Furthermore, it could be argued that a facility to rescind the Article 50 notification, allowing matters to continue as before, that might frustrate the intent of the Article, and the options afforded. The concern is that Member States wanting a better deal out of the EU could invoke Article 50 and then use it as leverage to gain concessions in exchange for revoking the withdrawal notice. It could also be used to tactical effect, with the withdrawing country withdrawing its notification, only to re-invoke Article 50 with immediate effect, thereby artificially prolonging the negotiating period. Tellingly, however, Article 50 also states: "If a State which has withdrawn from the Union asks to rejoin, its request shall be subject to the procedure referred to in Article 49". This is the full entry process. No concessions are made for previous membership. Rejoining demands completion of the full candidature procedure. This would require a commitment to joining the euro, which does not allow for the inclusion of any previously negotiated opt-outs. The juxtaposition, in the same article, can be taken as a deterrent, warning states considering an exit, that there is a great deal at risk. For a revocation of the notice then to be allowed would defeat the purpose of this warning. In my view, therefore, we need more than a few lawyers cited in the pages of the Guardian to accept that the Article 50 notification can be revoked. The chances are that the Government was right first time. Once notice is given, there can be no turning back.